To really get to know New Braunfels, you need more than a three-day weekend. In fact, it’s easy to fill an entire week with fun and relaxing activities. 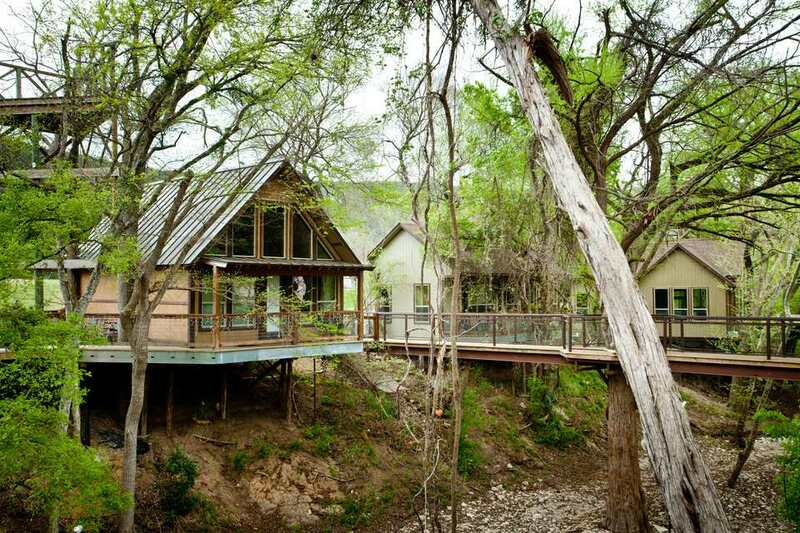 To get the week started, check in at River Road Treehouses (12660 River Road, 888-993-6772). The property features six luxurious cabins connected to trees, and some of them are even linked by walkways through the trees. After getting settled, grab a tube and take a dip in the river at the 1.5-acre park along the water. The full kitchen in each cabin makes it simple to bring your own groceries and cook for yourself. If you’re still restless after dinner, head down the road to the River Road Ice House (1791 Hueco Springs Loop Road, 830-626-1335) for a brew and live music. Most of the seating is outdoors, and the setting is beautiful. Bands range from up-and-coming country acts to high-profile performers such as Jerry Jeff Walker. Located in the heart of New Braunfels, Landa Park (164 Landa Park Drive, 830-608-2165) offers several forms of water recreation. You can go tubing through a tube chute in the nearby Comal River, swim in a spring-fed pool or cruise around in a paddleboat. After all that exertion, you’ll need a refueling stop. Blue Moose Pizza (188 South Castell Ave, 830-302-3333) is just a short drive from the park and it offers pizzas ranging from the relatively light Spring Pizza, with artichoke hearts and sundried tomatoes, to the Big Moose, with Canadian bacon, sausage, pepperoni, and mushrooms. A cavernous dance hall and music venue, Gruene Hall (1281 Gruene Road, 830-606-1281) hasn’t changed much since it first opened in 1878. In fact, there’s still no air conditioning (but plenty of fans). The humble venue attracts big-name country artists such as Loretta Lynn and Willie Nelson, but you can also see up-and-coming bands from all musical genres. On Sundays, Gruene Hall often hosts a gospel brunch with foods reflecting Texas’ many cultural influences, ranging from Tex-Mex migas to Polish sausage. A drive-through wildlife park, Natural Bridge Wildlife Ranch (26515 Natural Bridge Caverns Road, 830-438-7400) provides a relaxing and fun way to view animals from across the globe. Zebras, ostriches, and deer may walk right up to your car window. In addition to caring for the animals, the ranch breeds some of the species. In June 2016, Natural Bridge welcomed its 25th baby giraffe since 1984. The “little one” was 5 feet tall and weighed 120 pounds at birth. The ranch is home to 40 different species with 450 acres to roam. After driving around the ranch, you can get out of the car and visit the petting zoo. You can pet goats and llamas and even feed them. The giraffe barn is another popular stop where you can see these gentle giants up close. When you’re ready for lunch, head down the road to Las Fontanas (1551 N Walnut Ave, Suite 10, 830-626-3310), one of the best Mexican restaurants in New Braunfels. Whether you’re in the mood for Tex-Mex puffy tacos and enchiladas or authentic Mexican dishes from the Yucatan region, Las Fontanas will make you a happy traveler. A fully restored historic theater, Brauntex (290 West San Antonio Street, 830-627-0808) seats 605 people in a space that feels elegant and quaint at the same time. Originally opened in 1942, the theater had fallen into disrepair by the 1990s. A major community effort helped bring together the people and financing needed to bring the theater back to its former glory (and modernize the space). Many of the acts are country bands, but the schedule also occasionally features other styles of music, from Latin jazz to classic rock. If the performance puts you in the mood to sing yourself, stroll a few blocks to the Moonshine & Ale piano bar (236 West San Antonio Street, 830-608-0087). A piano player leads the crowd in rousing renditions of popular tunes everyone knows by heart. The friendly bar is also a great place to meet a few of your fellow vacationers. Start your day as early as possible to beat the crowds at Schlitterbahn (400 North Liberty Avenue, 830-625-2351). The tallest rides tend to have extremely long lines by midday, so you may want to start your adventure with some of the more extreme chutes that require you to climb up into the tower at the center of the park. The rides around the edge of the property tend to be a little mellower if you need a break from all the excitement. A nearby eatery that’s usually not as crowded as the tourist hotspots, Gourmage (270 West San Antonio Street, 830-214-6471) will quickly transport you to cheese heaven. You can start with a cheese, nut and fruit platter and peruse the menu for a while. Choose from a wide variety of sandwiches on freshly baked bread and crispy salads. For dessert, don’t miss the handmade gourmet marshmallows. After lunch, waddle on over to The Sophienburg Museum (401 West Coll Street, 830-629-1572). Through artifacts, historic documents, photos and other exhibits, the museum tells the story of New Braunfels’ German heritage. It’s a small museum, but it does a wonderful job of explaining how this charming town on the river came to be. At this point, your skin will probably need a little break from the sun. At Natural Bridge Caverns (210-651-6101, 26495 Natural Bridge Caverns Road), you can escape the heat while viewing breathtaking rock formations. The standard tour takes you on a half-mile walk 180 feet underground. In the Hidden Passages tour, you can see even stranger rock formations such as cave ribbons and turnip shields. Above ground, there’s also an adventure course and zipline. You can test your balancing and climbing skills on 47 challenging obstacles and then take a zipline off the 60-foot tower. Both gardening and history buffs will enjoy a visit to the home of Ferdinand Jacob Lindheimer, who is sometimes referred to as the Father of Texas Botany. He was also the editor of one of the first newspapers in the region. The New Braunfels Conservation Society (1300 Church Hill Drive, 830-629-2943) leads tours of the Lindheimer house and other historic homes in New Braunfels. Want to make your next trip to New Braunfels a romantic getaway? Then you may want to consider booking a room at the Gruene Mansion Inn. Built in 1872, the Victorian mansion is furnished with classic antiques and handmade furniture. And it’s only a short walk away from Gruene Hall. If you’re looking for a resort experience, consider the T Bar M Resort and Conference Center. With amenities such as a sports center, nature trails, putting greens and movie theaters, the T Bar M is an all-in-one vacation destination. Consider scheduling your next trip to New Braunfels around Wurstfest. For one week every November, downtown New Braunfels turns into one big German festival. Expect plenty of people in traditional German attire, music, beer and, yes, sausages. The quirky and generous spirit of the town is on glorious display during this fun annual extravaganza.